Not every person knows that the famous writer and poet Taras Shevchenko was closely associated not only with literature, but also with painting. Indeed, at the beginning of his journey in art, he was seen as an artist, thanks to which he was sent to study in Russia. In 1842, after the creation of the poem “Katerina”, Taras Shevchenko painted an oil painting, following it in the style of realism, following the same story, choosing a scene that goes right after the main character says goodbye to her lover – “Moskal”. 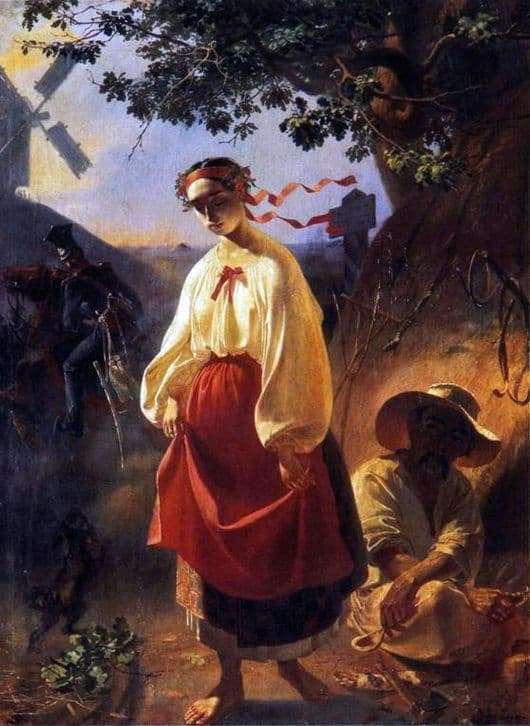 In essence, the “Katerina” of 1842 is the author’s illustration of the poem, but it is also complete according to some assumptions of various symbols (Katerina, as an image of Ukraine, a Russian soldier, as the Russian Empire, a peasant, as freedom in the distant past). What happens in the picture, if we turn to what a person sees, who knows nothing about the history of the Ukrainian people or the work of Taras Shevchenko? Depicted a pretty-looking girl, head down, walking on a dusty road barefoot. She is wearing traditional Ukrainian clothes: a white shirt with a red bow, a long skirt that does not reach twenty centimeters to the ankles, a wreath with a ribbon similar in color to her scarlet apron. Her, this sad dark-haired girl, judging by the name of the picture, is called Katerina. On the same dusty road under the tree sits a man, crossed his arms and legs. He is about 40-50 years old. On his face falls the shadow of a wide-brimmed straw hat; however, it is clear that this man is baleen, and his hair is black as pitch. But his linen clothing, contrasting with dark skin, is white. Slightly in the distance, a soldier of the Russian Empire is sitting on a reared horse – the very “Moskal”. Obviously, he is going to leave, so, despite the detail, his figure is somewhat vague. The background is a traditional landscape, but hidden in the fog. Dust mill and plain, and more – nothing at all.